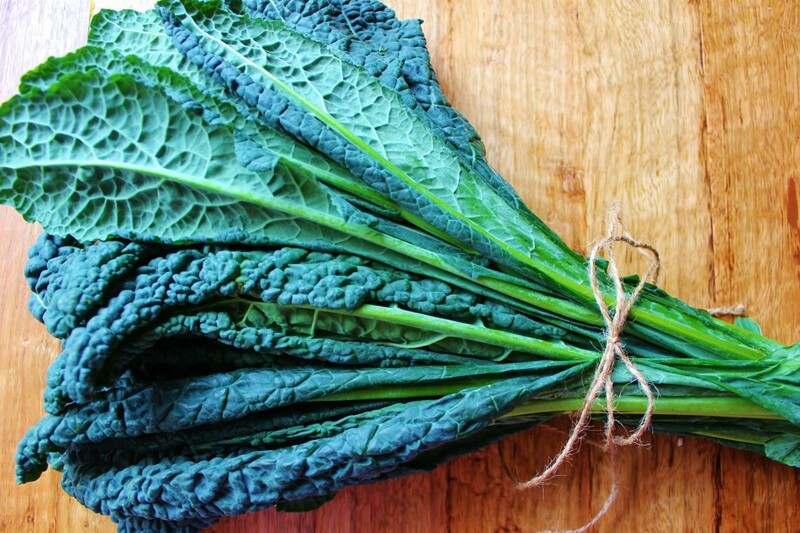 I’ve known the health value of kale for quite sometime and the taste and texture is something that I can’t get enough of. Seeing as I’m such a fan I wanted to share with you a simple way to make a well-balanced dish that’s quick and easy and really delicious too! After selecting the most beautiful, prana-filled dino kale you can find, you’ll want to use it right away or seal it in an airtight container and stow it in the coldest part of your fridge up to 3 days. In my house, kale never lasts that long as I’m always throwing it into something (breakfast, lunch, or dinner). 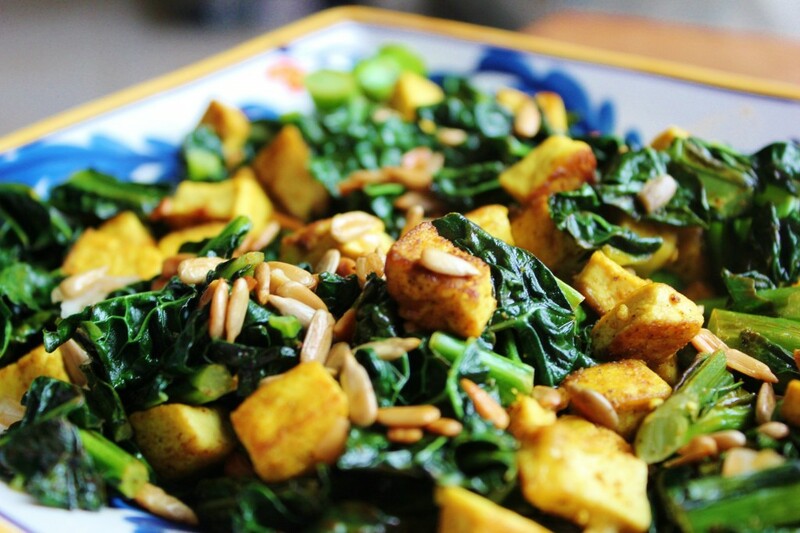 For this dish, choose a high-quality firm organic tofu and remember to drain your tofu– it’s like a sponge and comes packed in all that water so if you want more taste in your tofu, get the water out first by slicing the tofu and laying it out on a dish towel. Place another towel on top and then add some weight on top of it to help squeeze excess water out. Give it about 10 minutes. Then, you’ll cube the sliced tofu pieces and they’re ready for cooking. I toasted up some sunflower seeds which are best for Pitta-types but you could also opt for pumpkin seeds or toasted almond slices for Vata. 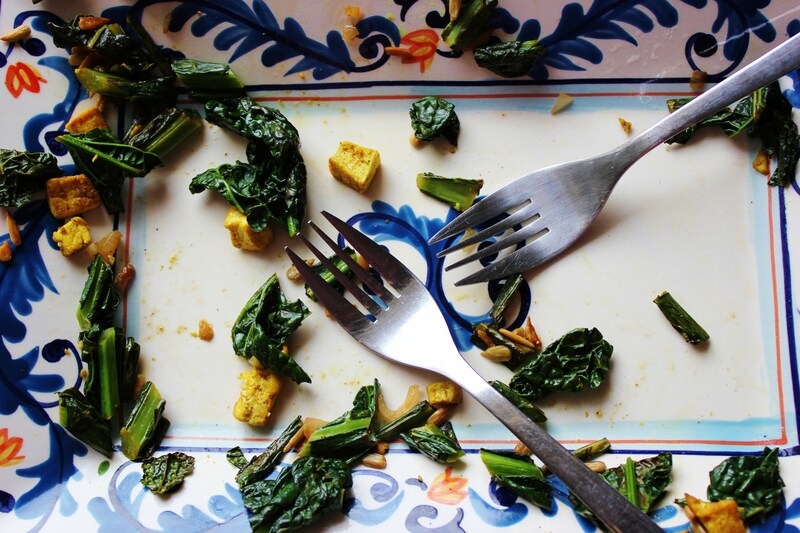 We ate it off the serving dish both of us devouring the savory tofu and warm, juicy kale. 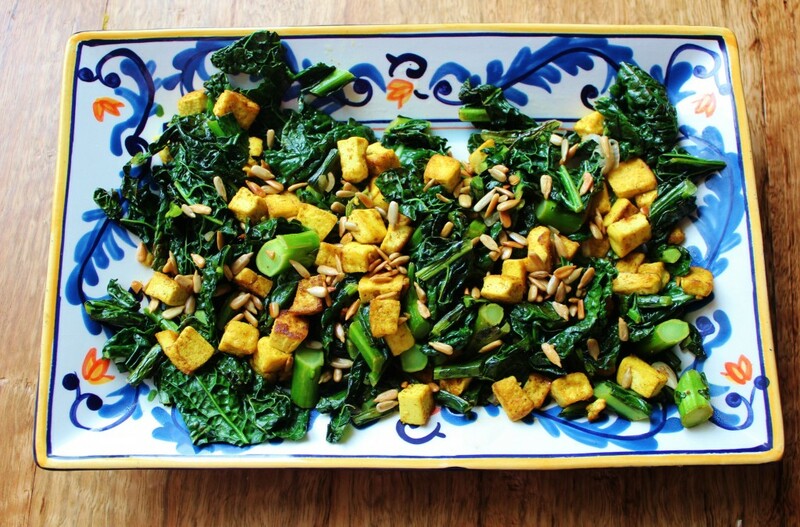 I’ve made kale in many different ways but this is one I’ll definitely do again. Start by heating 1/2 tablespoon of ghee (or EVOO) in a small fry pan over medium heat. Add 1/4 cup sunflower seeds and toast until golden brown. Remove from heat and set aside. Heat 2 tablespoons EVOO in saute pan over medium heat. Add curry powder and shallots. Once the shallots are translucent (about 1 minute) add tufu and stir briefly to coat tofu with the curry and onions. 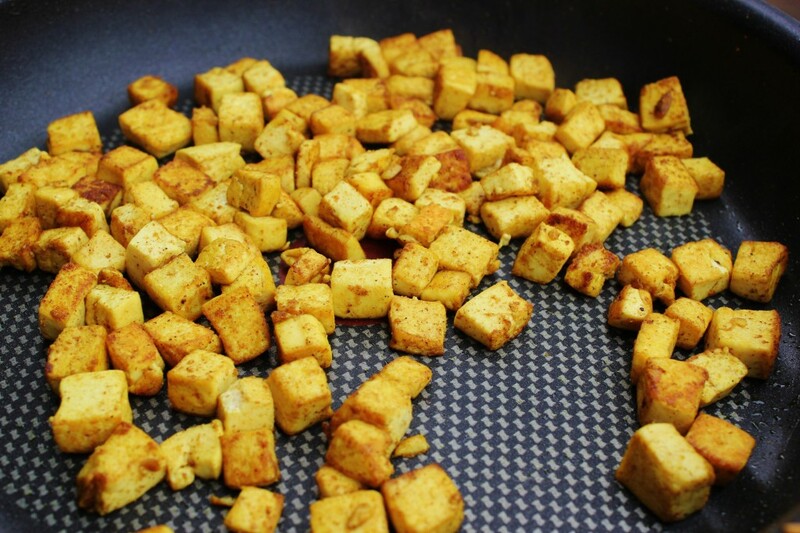 Spread tofu evenly on pan and leave to brown lightly stirring every few minutes. As the tofu is browning (after about 6-8 minutes) you will add the chopped kale into the pan with the tofu, squeeze the lemon over top, sprinkle with salt and continue to stir every so often until the kale stalks are cooked through yet still retaining their tenderness. Remove from heat, plate on serving dish and sprinkle with toasted sunflower seeds.